(Longueuil, Que.) 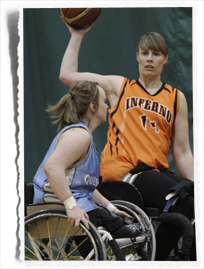 Team Quebec claimed a 60-56 win against undefeated Edmonton Inferno to seize the national crown Sunday at the 2016 Canadian Wheelchair Basketball League (CWBL) Women’s National Championship at Centre sportif Édouard-Montpetit in Longueuil, Que. The Calgary Rollers defeated the B.C. Breakers to secure bronze. Quebec’s win came after a hard fought battle against Edmonton Inferno. Quebec started out strong, carving out a 10 point lead by the end of the first quarter. The Inferno still trailed by six points at halftime but their players returned to the court with renewed intensity and took the lead late in the third. The teams began exchanging leads throughout the fourth. With the score tied 56-56 and only a minute remaining Quebec managed to maintain possession, giving their players a chance to find the basket. Cindy Ouellet and Elaine Allard of Quebec each scored two points, cinching the lead at the last moment and leaving the Inferno unable to retaliate before the final buzzer. We played as a team, we were only 13.5 on the floor and we had our ups and downs. It was a game of runs and Edmonton played really well. Ouellet paced the Quebec offensive and achieved a tournament-high 34 points in the game, while Arinn Young led Edmonton with 26 points. The B.C. Breakers found themselves just short of the podium after a tight game against the Calgary Rollers. Calgary pulled ahead with an early lead but B.C. pushed back to tie the game in the second quarter. The back and forth continued but the Calgary players found their stride just in time to outscore B.C. in the fourth quarter for a 62-53 win. Diane Sorensen and Jamie Jewells led the Calgary offense with 15 points each and Kady Dandeneau produced 18 points for the B.C. side. Team Ontario (0-4) placed fifth at the tournament after round robin play concluded on Saturday. Cindy Ouellet, of Quebec, was selected as the tournament’s most valuable player. Jamey Jewells (Calgary Rollers), Alarissa Haak (Edmonton Inferno), Amanda Yan (B.C. Breakers), Arinn Young (Edmonton Inferno), and Tamara Steeves (Team Ontario) were named to the all-star team.